Every grill master must have come across a grill mat before. Grill mats are made from a dense plastic-like material that can withstand high temperatures. They make cooking clean, safe and healthy and you get to enjoy the experience of grilling your food without worrying about them falling through the grates. We don’t want you to fall into the trap of low-quality grill mats that label their products as best to attract customers. For this reason, we have highlighted the best grill mats you can buy and what you need to look out for. Size: Grill mats come in various sizes. Ensure the size of the grill mat you choose can fully cover your grill to avoid spilling oil and food particles off the sides. Some mats can be cut to size to fit the grill; you may want to consider these. If the grill mats are thicker, they can be used more times than the other thinner grill mats. Safety levels: You may want to look out grill mats that are PFOA free. They will have no negative effects on your health. 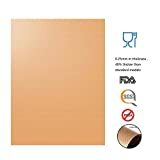 Non-stick mats ensure there isn’t much usage of oils and fats making the food healthier. 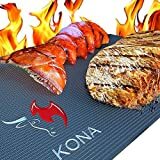 Kona XL Best Grill Mat - BBQ Grill Mat Covers The Entire Grill - Premium Non-Stick 25"x17"
This grill mat is all about flavor, the single most vital aspect that most of its competition seems to ignore. The non-stick surface which doesn’t need oil is great at averting flare-ups. This ensures your food retains its great flavor and you get some appetizing grill marks on them. This 25”×17” mat is 0.39mm thick and can be cut to fit your stove top. The staggering 600 ͦC peak temperature means you can place it on very high heat without producing a burning smell; this makes it perfect for virtually any type of stovetop. 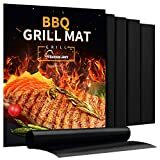 Grilling often demands to monitor with the enthusiasm of watching grass grow, however, this thick grill mat will let your veggies, kebabs, sausages or steaks to steadily heat into perfection. They can be used reversibly. There is a 7-year guarantee covering the product. Bring to an end the messy grills and keep your roast moist throughout with this gold grill mat from Aoocon. This mat boasts a non-stick surface that is easy to clean meaning you won’t be scrubbing anything after your cooking sessions. These kitchen accessories are capable of withstanding up to 500 degrees, just what you need for doing your meat, shrimp, pizza bacon and more. You are also sure to keep your food safe, tasty and juicy since these mats have met the FDA regulations for safety. You shouldn’t worry about burning your grill, neither should you expect to lose the small pieces to the fire. The mats can be used over and over and to wash them, just toss them into a dishwasher to clean them after use. Can be used on any stovetop. The package includes a set of 3 mats. 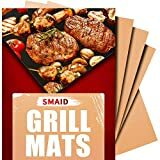 If you are planning to have your friends over for a one-of-its-own-kind rock the grill party, these set of six mats is the best bet for you. With a non-stick surface, you can be sure to enjoy all the juices and natural flavors of the delicacies you will opt to prepare without fearing of it sticking to the mats. This lends to their ability to easily wash off any cheese and oils making them safe for the dishwasher. It is designed to prevent the minutest morsels from falling through to the fire yet creates appealing grill marks on the steak. The total hygiene and original taste is also preserved as each of the pieces have been approved by the FDA as healthy and safe. Both sides of the mats are reusable for up to 100 times. There are 100% lifetime warranty and refund guarantee. Forget the poorly made grill mats that thwarted your love for barbecuing, I dare you to try this option and you will never regret. This one is tough material making it resilient enough to serve as a cooking surface for breakfast, lunch or dinner. It may not be the thickness option on our list but can still make it through up to 500 degrees; this makes it ideal for any source of heat. The non-stick surface ensures that the food does not lose its taste; this means mouth-watering meals at all times. This also makes the cleaning process of these reusable pieces easier. The FDA certifies that the mats are free of PFOA and other harmful substances that may affect your health. The can withstand conditions in a dishwasher. If you are looking forward to seeing a delighted face on your guest’s faces as they revel in the prepared delicacy, then this is the grill mat for you. 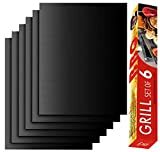 The pack of six reusable grill mats can roast anything from eggs and pizza to chicken, bacon and thinly sliced vegetables. The mats are praised for a 500 ͦpeak temperature so you can be sure of the ultimate cooking experience whatever the stove top you decide to use. Another nod to the mats non-stick nature that eliminates flare-ups and doesn’t remain with food on them like it happens when cooking directly on the grills. These pieces are designed to prevent any food particles from passing through and won’t allow oil to spill all over the place. It is FDA approved for safety. The mats are dishwasher safe. There are a black and black color options. Everyone admires a good barbecue like the olden days. 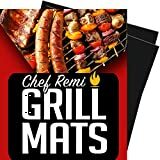 Whether it indoors or outdoors, barbecuing for a crowd or a small intimate one, nothing beats these grill mats. 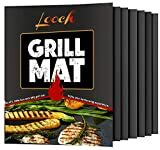 The high resistance material used in creating the three grill mats in this set has zero traces of PFOA and other harmful substances making them a healthy option too. Worry not about stickiness and messiness that come along with ordinary mats, this contributes to healthy eating and keeps the food flavorful. Again, the non-stick surface won’t demand oils and fats. The mats are multi-purpose and are perfect for ribs, pizza, bacon, and others. When you are finished, just toss them into a dishwasher and they will be ready for reuse. Leaves appealing grill marks on steaks and other foods. We understand how annoying it is when you have to get back scrubbing the greasy mess the rest of your afternoon after hosting a couple of friends. However, it’s now completely gone, this Bbq grill is finally here to take care of that issue. Every one of the four mats in this set is built with a sturdy fiberglass coating to withstand up to 500 ͦ. It is 100% non-stick ensuring mess-free grilling experience and sees to it that the food doesn’t lose their natural flavors and juices. Additionally, you can be sure of no dropping or spilling of food. After enjoying your sumptuous roast, simply place the mats in a dishwasher and they will be looking all new and ready to be used once more. PFOA and other toxic compounds are not included in the construction. 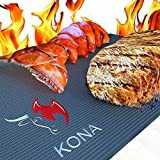 Bring the best out of the cook in you and make your cooking experience totally worthwhile with this set of 5 grill mats. The non-stick surface does away with all the mess that comes with grilling and the mat also prevents pieces falling through the gaps. The mats can perform optimally at a temperature between 300 and 500 degrees and allow you wipe hot grills without any fear of actually burning yourself. The mats are really thin, but surprisingly, they don’t burn or melt when you’re grilling. To keep them clean, you can use a dishwasher to wash the grill mats. The manufacturer knows how important the health of your loved ones and yourself is to you that why they never slack on that, they made sure there are no traces of PFOA r other unsafe chemicals. They can be used on any kind of grill. The set is highly affordable. You won’t be able to do without it once you get yourself this set of grill mats. It will save you time and frustration of grilling and barbecuing will turn to be the favorite activity when its holiday season. Don’t be discouraged that there are only two in the set, the thin yet tough mats are backed by a lifetime replacement guarantee so you won’t be replacing them ever again. 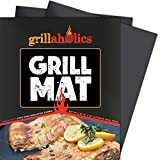 Use these mats when you are barbecuing in your backyard or picnic and you can be sure the food isn’t going to stick to the grill. Neither will it fall through the gaps on the grill. The fiberglass coating makes it resistant to temperatures as high as 500 degrees Fahrenheit making it safe for use on most grills. This excellent craftsmanship has been approved by some top renown chefs so you can click to buy with more confidence. The can be re-used and are dishwasher safe. The company offers a money back guarantee to dissatisfied buyers. They are extra-thick making them durable. The mats are easy to clean. With one of these top choices at your disposal, barbecuing should now be more fun than ever. Go ahead and click the pick that suits you and delivers a fantastic grilling while making the cooking experience less tasking. This will make you want to grill every chance you get.